According to The Canberra Times, the Yanks and Australian teenager Kyle Perkins are close to agreeing to a seven year deal. Perkins is a 16-yr old catcher at Daramalan College, and was first spotted by the Yanks last year at an Under-18 event in Western Australia. He is expected to come to the States in 2010, when he finishes school. This post is not a joke. Update: Loyal reader Ricochet points out that this is only the second Austalian teenager the Yanks have signed this month. So … um …when does Spring Training start again? He’ll be competing with Dmitri Young for the starting first base gig. Both are signed through 2009, with roughly the same salaries. But there isn’t room for both of them on the Nats roster. Each has his pitfalls, making a trade difficult. So what do you do if you’re Jim Bowden? Johnson is the team’s second highest-paid player, and Young is just a tick behind. Do you really let one of your top five highest paid players languish on the bench? At around the same time, Mike, Joe and I all came up with answer to that question. What do you do if you’re Jim Bowden? Why, trade Nick Johnson to the Yankees of course. The Yanks are an organization not afraid of paying a full salary and in need of a first-baseman. After leaving New York, Johnson continued to do what he has always done: get on base and get injured. In 2006, before his collision with Austin Kearns, he seemed to be breaking out. Injury-free, he had 23 home runs in the über-pitching paradise of RFK Stadium and was hitting .290/.428/.520. That’s a drool-worthy .948 OPS out of the first base position. 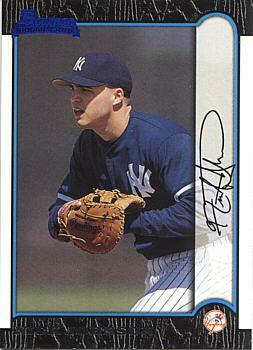 The Yanks haven’t seen that since Jason Giambi’s 2006 campaign, and even then, he DH’d for much of that year. The keys here of course are convincing the Nationals that they want to give up the younger Nick Johnson instead of the older Dmitri Young, settling on the other pieces of the trade and seeing that Nick Johnson is healthy. But, hey, we can dream, right? It’s fitting that we follow a post about Phil Hughes’ much discussed velocity with one about the hardest throwers in the minors. I didn’t do the legwork, BA did. We’ve heard alot about the high success rate of Tommy John surgery, but the #4 pitcher on the 2002 list is a prime example of a guy who’s stuff never returned to pre-TJ levels. Having two of the three hardest throwers in the minors is pretty badass. So there you go. Hughes looked great in September and October, and a strong start should put all of you velocity-doubters to rest.